It is a rare day when I find a tea room postcard that I don’t already own or that I strongly want to buy. The Aladdin Studio Tiffin Room is an exception, a wonderful discovery. The story of the Aladdin Studio and its owners, Hattie and Minnie Mooser [pictured seated on the postcard], turns out to be quite fascinating. The senior Moosers, the sisters’ parents, were German Jews who were part of the 1840s-1860s immigration, and who evidently inspired their four children to take up rather daring careers in the entertainment industry. The San Francisco tea room combined many functions. In the daytime it was a fairly conventional tea room with lunch and afternoon tea, hosting women’s groups, bridal parties, and card parties. Patrons could also have their palms read by a “seeress” named Mme. Rabbas, learn to play mah-jongg, dance, take Charleston and St. Louis Hop lessons, and buy hats, batiks, and lingerie in the gift shop. 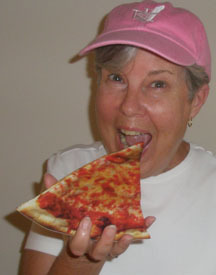 In the evening, visiting performers from stage and screen offered entertainment or simply gathered there for dinner. 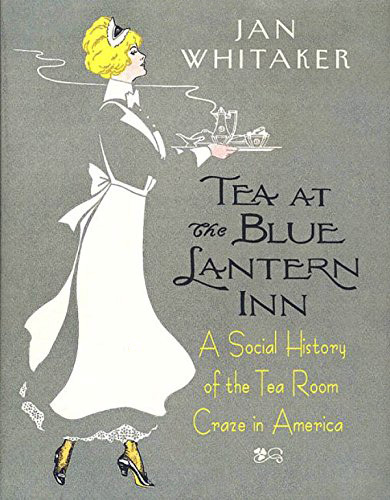 It opened on Sutter Street, its main location, in 1920, after having spent several years as part tea room and part children’s theater on Post Street. In 1925 it proclaimed itself a “Nite Club” of the sort found in NYC, Paris, and London, despite the fact that it was Prohibition and no alcoholic beverages were sold, nor even allowed on the premises. 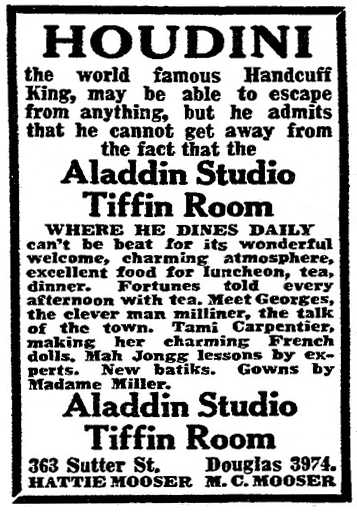 Increasing competition with bootleg places was identified as the reason for the Aladdin’s closure in 1929. Their main attraction was the celebrities who dropped by the Aladdin Studio. 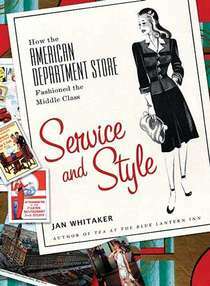 Hattie and Minnie were well connected to the entertainment world, since their brother George Mooser, as well as their late brother Leon, were tightly enmeshed in it as producers whose careers were anchored in Shanghai and New York City. In addition to bringing Chinese entertainers to the U.S., the brothers organized Western entertainments, such as circuses, in China. And they also brokered film distribution deals and a lawsuit against piracy in Asia for California motion picture studios. 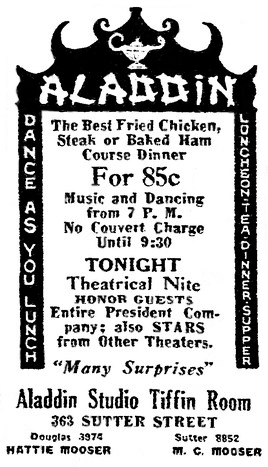 As a result of their connections – and Hattie’s and Minnie’s skill as hostesses – many show business celebrities visited the Aladdin, among them Houdini, Douglas Fairbanks, and the Marx brothers. 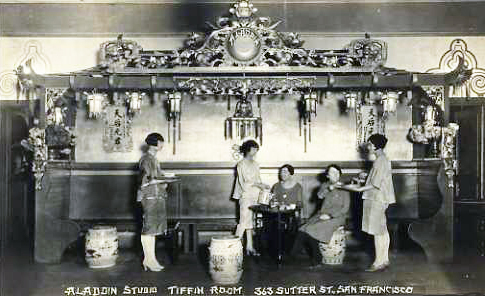 Although the never-married sisters had other occupations to fall back on such as stenography and other secretarial services, they continued serving as hostesses in other clubs after the Aladdin Studio closed, among them the Beach Chalet in Golden Gate Park and the Club Trouville at the old Aladdin location. In 1931 they opened a new place, modeled on the Aladdin Studio but called Aladdin Tavern, on Van Ness Avenue. 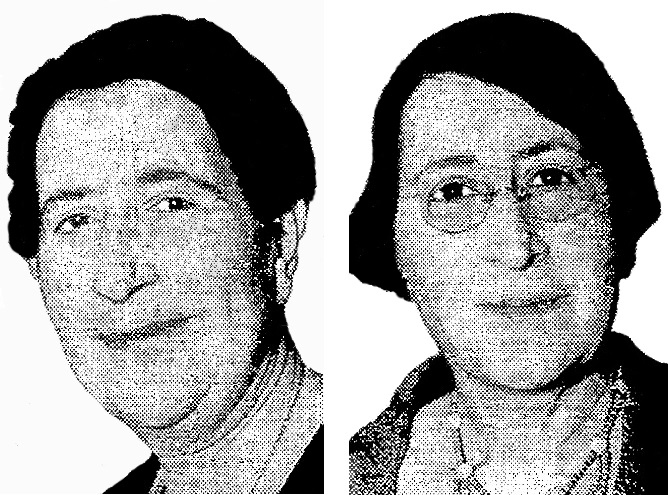 Now in their 50s [(l) Hattie and (r) Minnie in 1936], though still referred to by the columnists as “the delightful Mooser girls,” they could not make a go of it. In 1965, a reporter found the sisters, now in their 90s, living in Daly City CA and reflecting about their friendship with Harry Houdini.